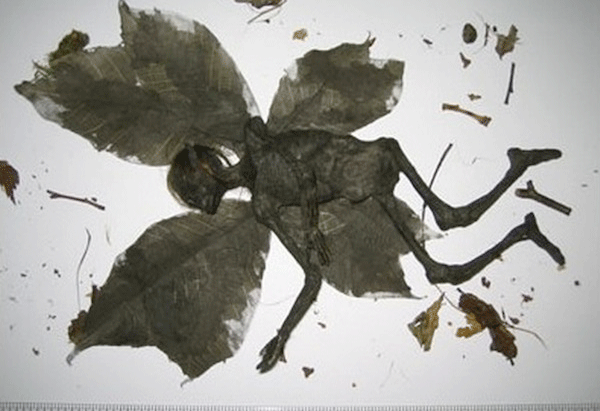 The Dead fairy hoax was an April Fools’ Day prank in 2007. Dan Baines, a sculptor and illusion designer, managed to sell his creation, the fake corpse of a fairy, on an internet auction for nearly £300. A few days before April 1, 2007, Dan Baines, a 31-year-old illusion designer for magicians from London, posted on his website images of the “corpse” of an unknown eight-inch creation. The unusual corpse was claimed to be the mummified remains of a fairy which was discovered by a dog walker at Firestone Hill in Duffield, Derbyshire. The remains, as shown in the pictures, were complete with ears, wings, hair, skin, and teeth, and were claimed to ‘have been examined by anthropologists and forensic experts who can confirm the body is genuine’. 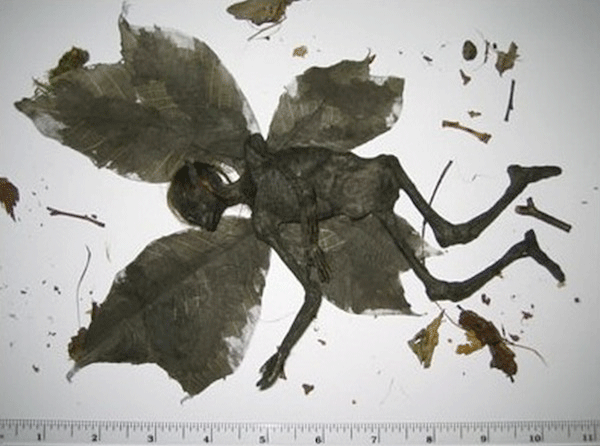 According to the website, X-rays of the ‘fairy’ showed that its body’s structure was the same as that of a child. The bones, however, were described to be ‘hollow like those of a bird, making them particularly light. In spite of the coming of April Fool’s Day, the website received feedback from a large number of fairy believers, accumulating over 20,000 hits in one day. On April 1st, Baines appended a note to the website, thanking the readers for expressing their interest in his story and acknowledging that the fairy corpse was fake. He wrote: “Even if you believe in fairies, as I personally do, there will always have been an element of doubt in your mind that would suggest the remains are a hoax. However, the magic created by the possibility of the fairy being real is something you will remember for the rest of your life.” Subsequently, Baines listed the mummified fairy on eBay and the model attracted nearly 40 bids. The highest at the close of the sale was made by a private art collector in the United States and the fairy was sold for £280.